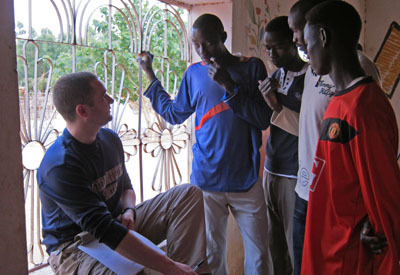 Editor's Note: Middle school social studies teacher and coach Brian Cleveland recently returned from the Darfuri refugee camp of Djabal. He travelled to eastern Chad with Darfur Dream Team partner iAct to recruit players for the brand new soccer team Darfur United and wrote this guest blog post about the visit. I consider myself quite fortunate for having had the chance to meet and interact with the people of Darfur whose plight I have become so very passionate about as I’ve learned about the history of the conflict. Just four years ago, I wouldn't have been able to point out Darfur on a map. Since then, I have taught about Darfur, it's people, and the genocide to my seventh grade social studies classes at Seymour Middle School, in Seymour, CT. The experience has taken me to places I would have never imagined. Just a month ago, I heard through the Darfur Dream Team that one of their partner organizations, i-ACT, was in need of an assistant soccer coach for their new project, Darfur United. With the experience of teaching about the Darfur genocide, and having played and coached soccer at the college level, I felt the opportunity was meant to be. So, after three days of hearing about the project, I was accepted as the assistant coach for Darfur United, and I had two weeks to pack. I decided to go thinking there was not much more I needed to know about the conditions of eastern Chad—where an estimated 264,000 Darfuris live, displaced by ongoing insecurity in Darfur—or what this amazing group of people have experienced to prepare myself for what was about to unfold. Boy, was I wrong. There is no way possible to prepare yourself for the feeling you have when you get out of the U.N. vehicle for the first time arriving at the refugee camp. What it’s like to hear the stories Darfuris told and work in the over 100 degree heat can never be fully anticipated through reading the news, watching documentaries, or teaching the subject—no matter how interactive it may be. Aside from my coaching duties and involvement in try outs for Darfur United, I was fortunate to have met one of the leaders of Goz Amer camp, Umda, where our sister school is located. He is an incredible human being to say the least. Seymour Middle School had just recently signed up for the sister schools program and raised over $1,300 for our school, Choula A, during a week-long fundraiser. We were able to set up a formal meeting where I got to sit down with Umda and hand deliver posters, letters, and friendship bracelets my students made for their classmates halfway around the world. Never had I imagined I would ever be hand delivering items from my students to one of the leaders of the camp we were connected to. This man, who experienced the genocide first hand, as the Janjaweed attacked his village and he successfully led thousands to safety in eastern Chad, was telling me how grateful he was for the gifts, and more importantly for supporting his schools, knowing that education is the only hope for a clear, stable future. I felt very honored to receive Umda’s gratitude on behalf of my community. Since we were holding our Darfur United try outs at Camp Djabal, I did not have the chance to meet any other students or teachers from our sister school, but I made a point of it by forging relationships with the local students. These friendships always led to conversations about the importance of education. Students like Rahma, Murtada, and Ali all know education is their best hope to a better future and can possibly pave the way to a secure homeland in Darfur. A simple gift of a Kindle, talking dictionary, and atlas put smiles on their faces that came straight from the heart. It is devastating to hear Rahma describe his situation: He desperately wants to further his education at a university, but knows there is no hope after he finishes secondary school at Camp Djabal. Being a very bright individual, he understands that he and his generation are the future for Darfuris. But, with resources scarce in the camp and the inability to return to homeland, he will be forced to try and make something out of nothing, along with the rest of the refugees at his camp. The people I met in Djabal have lost everything, including family members, land, possessions, and the ability to support themselves. Most of us in the United States could not begin to put ourselves in their shoes. The camp’s residents depend on NGOs for their food on a monthly basis, organizations like the U.N. refugee agency and Darfur Dream Team for their education, and i-ACT for their many initiatives to improve the quality of life—needs that we in America take for granted on a daily basis. Although I was pulled towards learning about the local refugee educational process, I had a job to do. The selection process for the Darfuri soccer team wasn’t just about running drills and scrimmaging; Darfur United is about bringing together refugees from different groups, backgrounds, and camps. The top five players from each camp met us at Camp Djabal so we could choose the top 15 players along with five reserve players. Many of our players exclaimed about how this was the first time refugees from each of the twelve camps were brought together. The players selected for the team know they will represent all Darfuri people as they train with the ambition to play in the international VIVA World Cup soccer tournament in Kurdistan in June. Darfuri people have something to root for and be proud of, our players said—an opportunity for the world to hear a positive story of Darfur. The team and I hope that, through the beautiful game of soccer, Darfur United can fulfill its name and give Darfuris a chance to tell their story on an international level. Brian Cleveland is a seventh grade social studies teacher at Seymour Middle School in Seymour, Connecticut, where he also coaches girls basketball and soccer. Update: An earlier version of this post mistakenly noted that the VIVA World Cup soccer tournament would be held in late May.